My hair is naturally very thin and straight but I love the look of loose, beachy waves. I've tried countless hair products over the years ranging from very expensive to very cheap. While I do believe that hair products make a big difference, I've found that you don't have to spend a fortune to have volume, body and shine. Since I color my hair, I'm a firm believer in sulfate free shampoo and conditioner. I like to switch up my shampoo and conditioner from time to time so I alternate between #'s 1 & 2 on my list. The products and tools below are some of my all time favorites. What are your favorite hair care products? I'm always excited to try something new! 5. John Frieda Full Repair Root Lift Foam - Great root lifting foam that works! 7. Tigi Bed Head After Party - My favorite smoothing creme that I've been using for years! I use the Pureology Hydrate line too! My hair has never been as healthy! I heard coconut milk is quite good for your hair, as well as egg yolk or white or even both. I use Organix Coconut Milk conditioner ~ it makes my hair feel relatively soft! Do you ever get split ends O: ? Have a great weekend, Audrey! What a crazy coincidence! I was just reading up on how to grow out my fine, naturally curly hair and read about shampoos sans sulfate being the best. Now I don't have to read every bottle looking for it, thank you! I'm about to try olive oil conditioners, hopefully that will help my ends. And I love love love all-natural shine enhancing products. And dry shampoo for my bangs. Some people are iffy about Tresseme's but I swear by it. I need to try that root lifting foam...and the sans sulfate shampoo! I have really fine hair and can always use health and body. Thanks for the recommend, dear! Thanks for doing this! 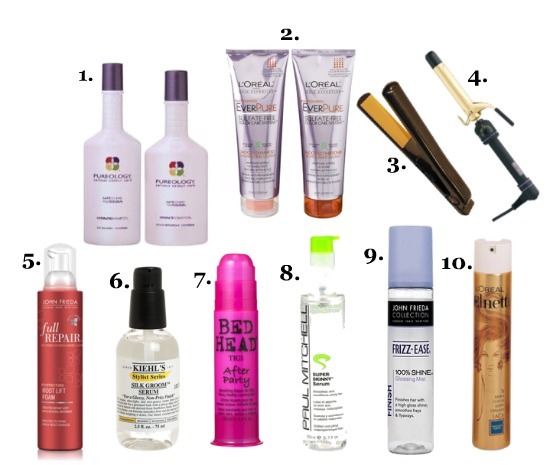 I have pin straight hair, and always like to see new (preferably cheap) products! Loving your hair care products. I love seeing what others use for beauty products. I'm a new follower to your blog as I just stumbled on your blog through Hello Cotton. Hope you have a great Easter weekend. i've been meaning to try elnett for years, it is supposed to be great, plus the vintage looking packaging is so charming. Some great products here! I will need to check out some of these! I too like to switch up my shampoos and conditioners once in a while. I absolutely can't live without Moroccan oil! That's my #1 fav hair product. These are great picks, I love Pureology too! Oh i love bad head stuff, i'm using them for many years! I REALLY LOVE YOUR POST!! IT'S SO STUNNING!!!!WOW!! !DO U WANT TO FOLLOW EACH OTHER? Thanks for your post on the hair care basics you like. I believe that a good diet is also one of the hair care basics, salmon in particular. Also you need to choose the right hair care products that are suitable for your individual skin type. all products seems to be the best hair care products!! !